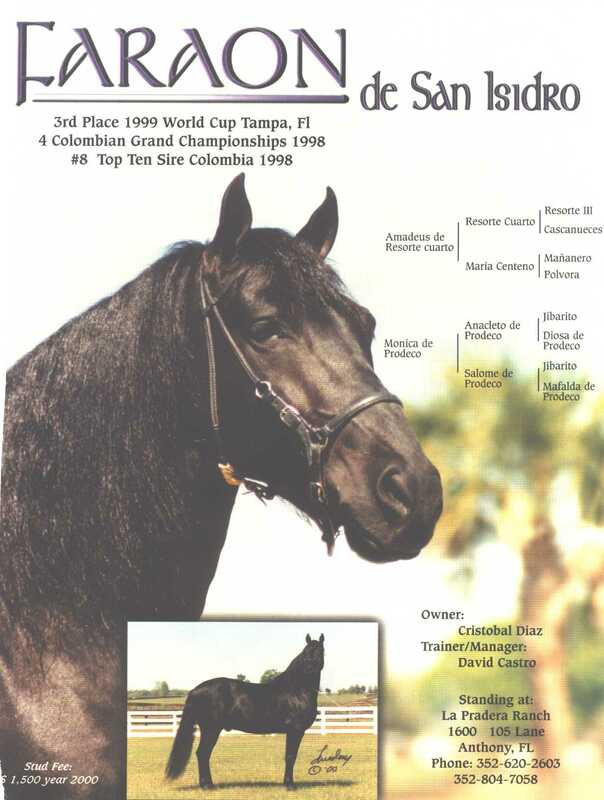 Gorgeous black fino stallion who has been four times a Colombian Champion; Champion at Extravaganza 1999 in Ocala, Florida; 3rd Place Confepaso World Cup 1999 in Tampa, Florida; and GRAND CHAMPION Spectrum 2000 in Tampa, Florida. In his home country of Colombia Faraon has been in the top ten sires list several times. Excellent bloodlines, disposition, elegance, and gait are reproduced by this superior stallion. This stallion has so much HEART to offer besides his talent! Owned by Coco Morales of Anthony, Florida.